We are so grateful for our amazing community of supporters and want to show you what a difference you make in the lives of St. Patrick's students. As is true at most independent schools, tuition does not cover the full cost of each child’s St. Patrick’s education. Giving ensures that we are able to meet our strategic goals­­ of attracting and retaining the most talented faculty and staff, promoting a diverse student body, maintaining our outstanding physical plant, and continuing to enhance the educational experience. The two largest fundraising efforts at St. Patrick's, fiscally and in volunteer involvement, are the Annual Fund and the annual Auction to Benefit the Financial Aid Program. We invite you to participate and to learn more. For generations, St. Patrick’s has benefited from a strong culture of philanthropy. From our humble beginnings as a six-student nursery in the Church basement to today, each generation of St. Patrick’s families has provided generously for students in the present and in the future. 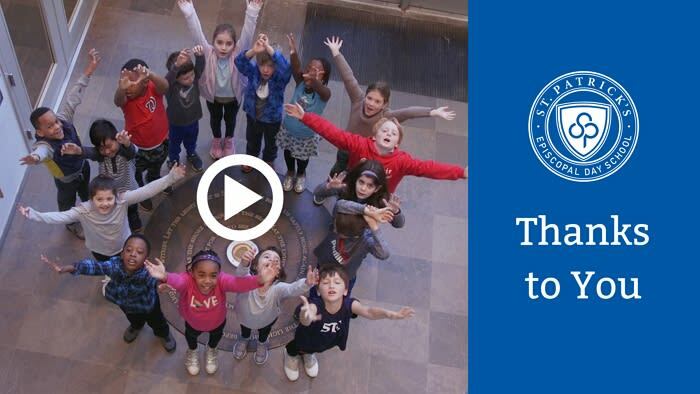 As the beneficiaries of previous families’ vision and generosity, we must be responsible stewards of this special place not only for our own children and their classmates but for future generations of Day School Students.